In 1900 Thomas Edison introduced the Nickel-Iron Battery. With improved electrolyte technology we now have the Zapp Star Battery. The structure is simple with a nickel oxide-hydroxide cathode and iron anode. This battery proved over time to be the most robust, tolerant of abuse and more capable of total discharge compared to any other battery in history. Nickel-Iron batteries have long been used in European mining operations because of their ability to withstand vibrations, high temperatures, and other physical stress. In many respects the Zapp Star Battery is almost 'too good.' While the lead acid battery permanently loses capacity with use, the Zapp Star Battery never permanently loses capacity. If the user completely drains the lead acid battery, capacity is severely diminished or often destroyed. 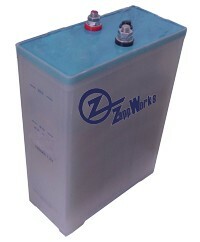 The Zapp Star Battery with complete discharge can be recharged to 100% capacity. The only downside to the battery is operating in extreme cold weather. For optimal performance the Zapp Star Battery is best maintained between 60F and 100F. Edison's batteries were made from 1903 to 1972 by the the Edison Battery Storage Company in East Orange, NJ. The company was profitable. In 1972 the battery company was sold to the Excide Battery Corporation, which discontinued making the battery in 1975 because the company decided to focus on the consumable lead acid batteries. Unlike Exide the goal of Zapp Works, Inc. is to provide products lasting a lifetime. The Zapp Star Battery is such a product. In utility and cost the battery life of other battery systems do not come close to the life of a Zapp Star Battery. While the initial cost of the Zapp Star Battery is 20-25% greater than a lead acid battery, over time the Zapp Star Battery is significantly cheaper and has greater utility than the lead acid battery. The lead acid battery with no abuse lasts between 5 - 7 years, while the Nickel-Iron battery with abuse has lasted over 100 years. In a 50-year period the consumer will typically spend well over 10 times as much for a lead acid system compared to the Zapp Star Battery system. The Zapp Star Battery is truly a purchase that will last a lifetime.